In a round about ‘pay-it-forward’ fashion, graduating UF surgical resident Chris Garces, M.D., has been taught by those who learned from the surgeon who cared for his father. A life-changing event prompted Garces to alter his career plans. Always focused on becoming a businessman, the loss of his father to cancer at too young an age set Graces on a course for a career in medicine. As he completes his general surgery training this summer at the College of Medicine, he hopes to make an impact in a field in which there is need for improved therapies. Garces is heading to the University of Virginia to complete a two-year general thoracic surgical residency; one of only 14 spots nationwide. He hopes to blend his interest in research with his skill for surgery to improve the outcomes of patients with lung and esophageal cancer. “There is a huge area of potential improvement with regard to survival and treatment of patients with these cancers,” said Garces. He added that the field seemed like the right fit to him because of his interest in surgery, cancer research, and the anatomy of the chest. 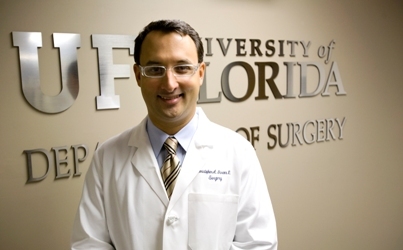 Garces graduated from the University of Wisconsin Medical School prior to coming to UF in 2001 as a general surgery resident. While at UF, he also completed a two-year surgical oncology research fellowship in the cancer research lab of William Cance, M.D., a professor of surgical oncology. Garces said he initially came to UF to become a surgical oncologist, noting UF’s great history in the field. He added, however, that the surgeon who operated on his father in New York is the same man who trained three of the department’s surgical oncologists: Cance, and associate professor Steven Hochwald, M.D., and assistant professor Stephen Grobmyer, M.D. Paying it forward, Garces plans to pursue an academic surgical career in thoracic oncology, enabling him to teach and care for others, as well as advance the field of surgery. Garces is one of four general surgery residents completing their training this year. Continuing their training at UF, Scott Anderson, M.D., begins a pediatric surgery fellowship, and Catherine Velopulos, M.D., starts a critical care fellowship this summer. Priscilla McAuliffe, M.D., Ph.D., will begin a surgical oncology fellowship this fall at the University of Texas’ M.D. Anderson Cancer Center in Houston.